Visit in the Summer and enjoy swimming in the warm crystal clear waters. In Winter, enjoy the near deserted islands to yourself. We are comparing Ria Formosa Islands Boat Trip Prices from leading ticket suppliers and Try to find you Cheap tickets prices on the market. Ria Formosa is a stunningly beautiful lagoon system of barrier islands, 170 km² of the area having been designated a natural park. Accessible by boat trips from the port of Faro in Southern Portugal, tourists enjoy relaxing on the white sandy beaches, swimming and snorkeling in the crystal clear waters and exploring the inhabited port towns. Culatra Island is the perfect place to stop to enjoy lunch in one of the harbor restaurants. This island has no roads (or vehicles), just wooden walkways where you can enjoy a leisurely walk after a delicious seafood meal. At Farol Island you can walk to the picturesque lighthouse, spend time in one of the beach bars, chat to the local fisherman, or relax on the beach. The stop at Ilha Deserta allows more time for swimming/snorkeling and leisurely walks along the beach – If you like collecting seashells you'll love this island! An enjoyable boat trip for people who love nature, spending time at the beach, and exploring coastal islands. There is no guided tour around the islands so you need to be comfortable with going off and exploring on your own, being sure you're back at the boat at the scheduled time. Everyone will get something from this trip as they soak up the sun on the sandy beaches, learn about the local culture and history, spot the wildlife including pink flamingos and go sightseeing around the harbour islands. Your Experience With Ria Formosa Islands Boat Trip? 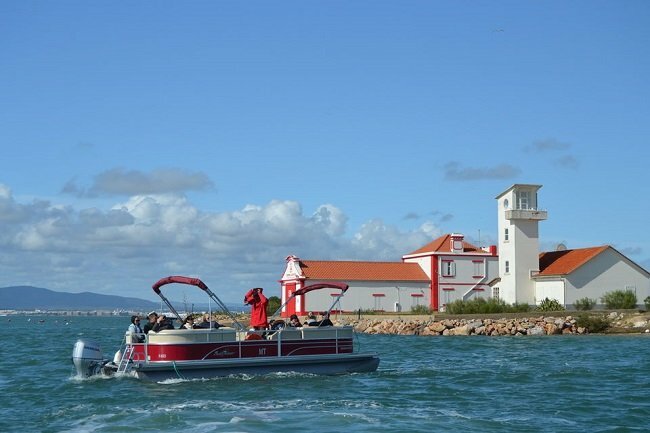 You will meet at the port of Faro and travel by small boat seating up to 12 passengers to Ria Formosa Nature Park. With a knowledgeable and professional local guide on board you will learn about the diverse ecosystem of this unique area and also learn about the history and culture as you pass by stunning scenery with photo opportunities every second of the journey. The boat stops at 4 picturesque islands – On the near-deserted island you can swim, snorkel, sunbath and walk along the sand collecting shells. At Farol Island you can take photos of the picturesque lighthouse and walk to it if you would like, otherwise just relax in a beach bar, swim in the sea, or work on your tan some more before moving on to the next island. At Culatra Island you can enjoy some fine seafood dishes if you feel hungry, or enjoy the peace as you explore the walkways of this island where traffic doesn't exist. After a fun half-day (approximately 5 hours) you will return to Faro port. What Ria Formosa Islands Boat Trip Includes? Return boat trip from Faro to Ria Formosa Nature Park, stopping off at 4 islands during a half-day trip. Time for you to explore the islands on your own, meeting back at the boat at scheduled times. A knowledgeable English speaking guide will tell you about the diverse ecosystem of the park, help you spot the wildlife such as pink flamingos and explain the local culture and the history as you journey between the islands on the small motorboat. See the lighthouse at Farol island. Explore the harbor at Culatra Island. Relax on a variety of beaches and swim in the sea. See coastal birds including beautiful pink flamingos. Cruise past the clam farms and oyster beds. Pack your beachwear/swimwear including snorkel and mask. Binoculars are recommended for bird watching. Take some drinks and snacks with you. Travelers Reviews about Ria Formosa Islands Boat Trip? The half-day Ria Formosa Islands Boat Trip has a 5 star rating on Tripadvisor. Visitors talking about this tour on TripAdvisor, Viator, and Getyourguide are, over all, extremely happy with the trip and encourage others to go on this tour. They agree that the trip is well organized with friendly and informative guides and well worth doing. Some travelers complained of trips returning late. E-ticket or printed ticket to be shown when boarding Tickets are fully refundable up to 24 hours before departure when purchased from Get Your Guide, or up to 7 days in advance if purchased from Viator. You must arrive at the boat 30minutes before departure time. Faro Port – Check your booking confirmation for directions.